BEIJING, April 3, 2019 /PRNewswire/ -- Since the beginning of the 21st century, the development of the global automotive industry has been almost stagnant. In stark contrast, China's car ownership and market size have continued to grow in recent years. The autonomous driving industry is becoming more popular, and the derived field: high-definition maps have also received much more attention. High-definition maps are often referred to as the "brains" of autonomous driving. Different from traditional navigation maps, high-definition maps must not only accurately recognize dynamic traffic information, such as the lane models, road components, road attributes, but also clearly determine road congestion, construction conditions, traffic accidents, traffic control conditions, and weather conditions. 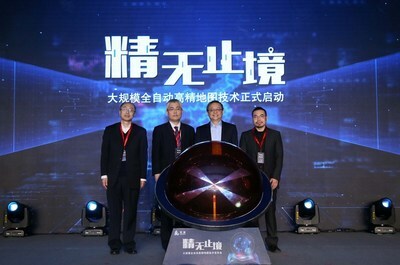 The "Extreme accuracy - Large-scale Automatic High-definition Map Technology Conference" held by KuanDeng Technology demonstrated the technologies of large-scale networking, automatic processing, and map collection in the field of high-definition maps. The visual-based technology allows KuanDeng Technology to achieve greater advantages in scale, automation, and speed, which is quite different from traditionally using a lot of manpower and material resources. The founder and CEO Liu Jun of KuanDeng Technology said, "Every industry revolution is a new market opportunity when technology and environmental conditions are in place at the same time. Today, high-definition maps will establish a new industry based on technology, model and demand." He believes that in terms of technology, thanks to the support of artificial intelligence, various highly accurate image processing techniques have made high-definition map innovations possible. Secondly, in terms of model innovation, the popularity of intelligent driving and intelligent networked vehicles has made crowd-sourced maps possible, making the production model of high-definition maps a truly disruptive opportunity for the first time. Finally, with the rapid development of assisted autonomous driving and autonomous driving, more demand has emerged, which will also promote the renewal and development of the entire industry. The KuanDeng Technology's high-definition maps not only present the road shape, slope, curvature, paving, direction and other information like normal maps do, but also include detailed data on lane line type, lane width, roadside landmarks, fences, road edge types, etc. It will provide powerful technical support for industry developers and partners to develop autonomous driving, and also promote commercial application of automatic driving in various scenarios.